How many times have you seen some manual process and thought to yourself how much easier your life would be easier if that process were automated? 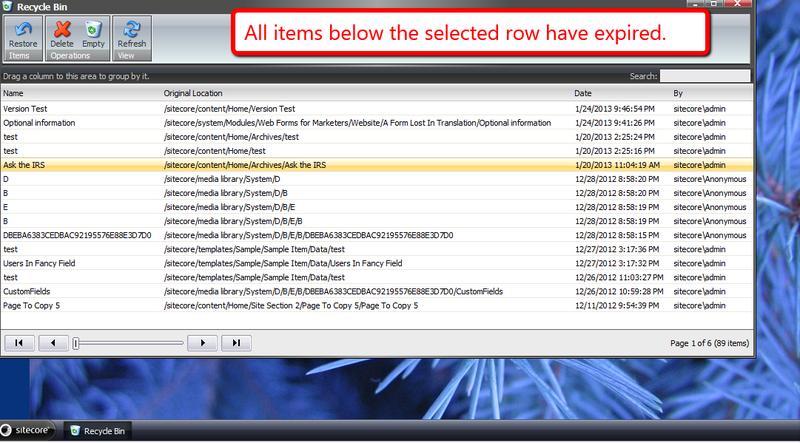 Custom Sitecore task agents could be of assistance on achieving some automation in Sitecore. 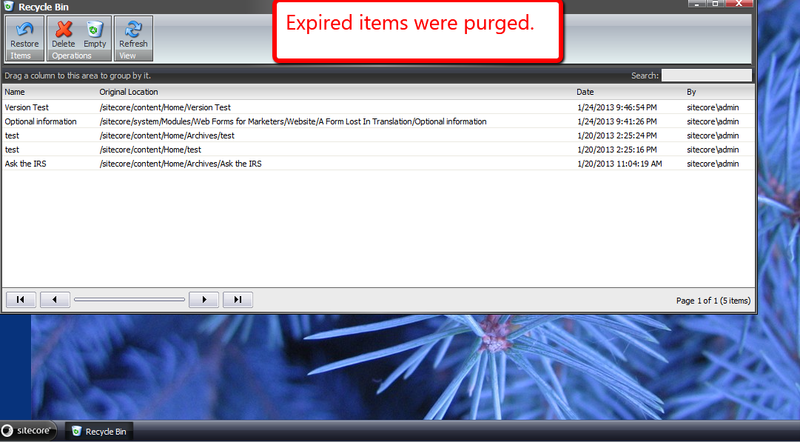 Last night, I built a custom task agent that deletes “expired” items from the recycle bin in all three Sitecore databases — items that have been sitting in the recycle bin after a specified number of days. I came up with this idea after remembering an instance I had seen in the past where there were so many items in the recycle bin, finding an item to restore would be more difficult than finding a needle in a haystack. 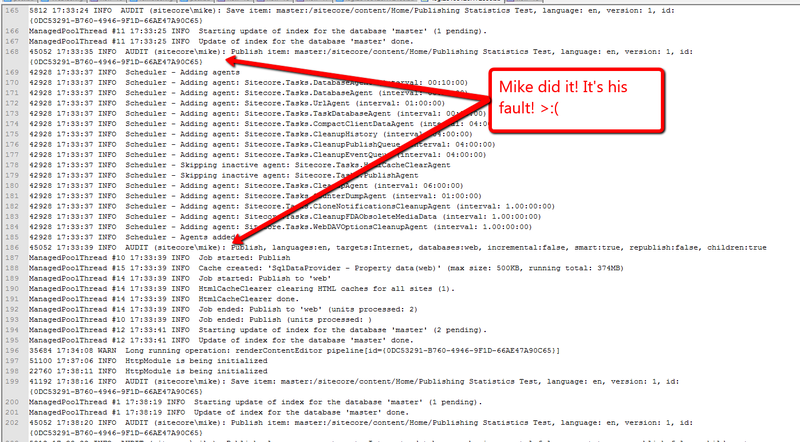 Using .NET reflector, I looked at how Sitecore.Tasks.UrlAgent in Sitecore.Kernel.dll was coded to see if I had to do anything special when building my agent — an example would be ascertaining whether I needed to inherit from a custom base class — and also looked at code in Sitecore.Shell.Applications.Archives.RecycleBin.RecycleBinPage in Sitecore.Client.dll coupled with Sitecore.Shell.Framework.Commands.Archives.Delete in Sitecore.Kernel.dll to figure out how to permanently delete items in the recycle bin. Time and time again, I keep hearing about content in Sitecore being published prematurely, and this usually occurs by accident — perhaps a cat walks across the malefactor’s keyboard — although I have a feeling something else might driving these erroneous publishes. However, in some instances, the malefactor will not fess up to invoking said publish. 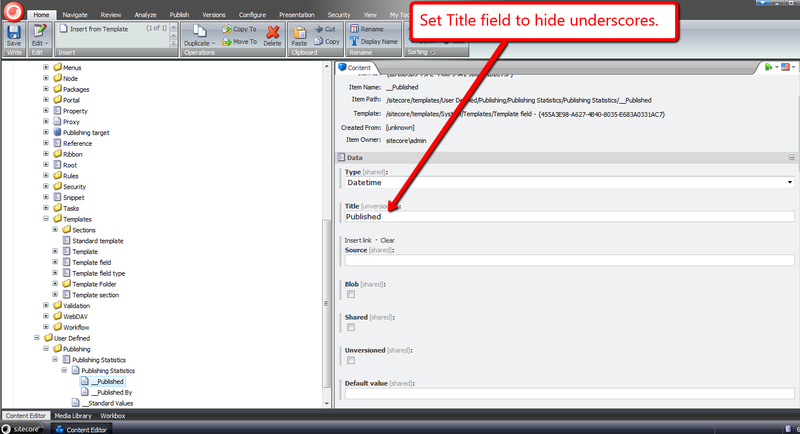 Seeking out who had published a Sitecore item is beyond the know how of most end users, and usually requires an advanced user or developer to fish around in the Sitecore log to ascertain who published what and when. Given that I keep hearing about this happening, I decided it would be a great exercise to develop a feature to bring publishing information into the Sitecore client. We can accomplish this by building a custom PublishItemProcessor pipeline to log statistics into publishing fields. 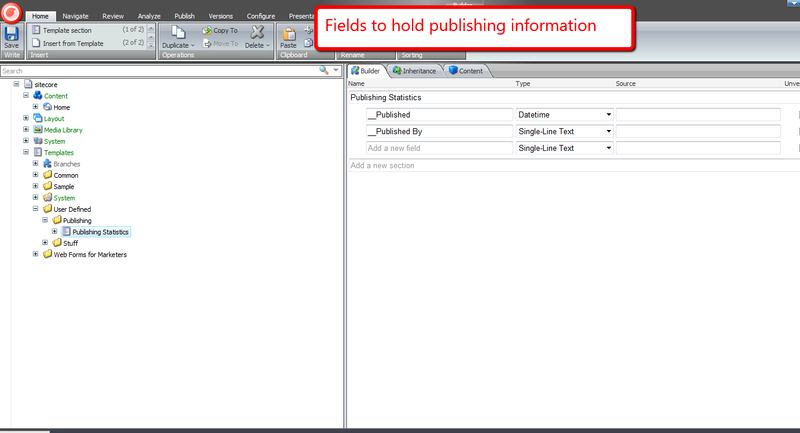 First, I created a template containing fields to hold publishing information. 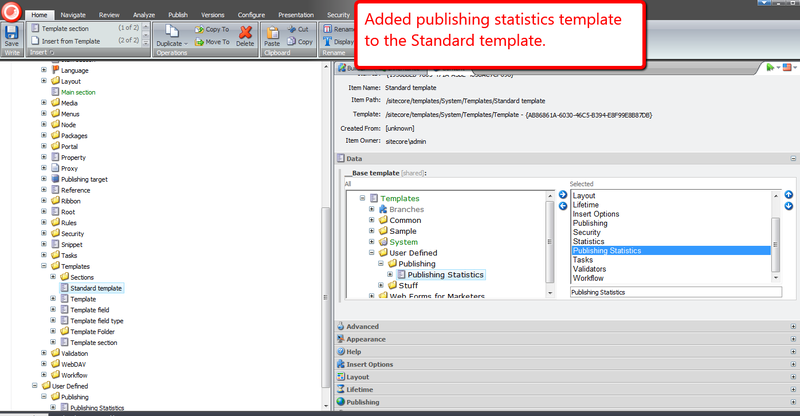 These fields will only keep track of who published an item last, similar to how the fields in the Statistics section in the Standard Template. My PublishItemProcessor sets the publishing statistics on my newly added fields on the item in both the source and target databases, and only when the publishing fields exist on the published item. Yesterday evening, I decided to fish around in my local Sitecore instance’s Web.config to look for customization opportunities — doing this definitely beats vegging out in front of the television any day — and thought it would be an interesting exercise to create a custom hook. 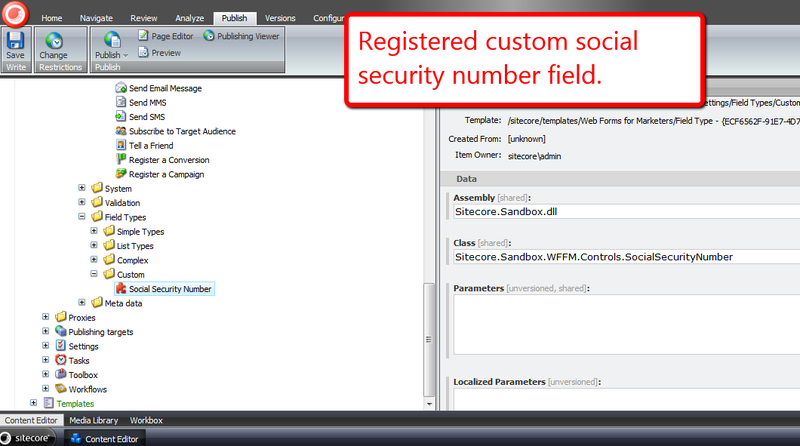 Before I dive into the custom hook I built, I’d like to discuss what a Sitecore hook is. You can consider a hook to be an object containing code that you would like executed in your Sitecore instance, but see no logical place to put said code. You’re probably saying to yourself “Mike, that is an extremely generic and ridiculous definition.” I don’t blame you for thinking this, although I can’t really define what a hook is any better than that. If you have a better definition, please leave a comment. However, to put things into context that might aid in defining what a hook could be, a hook is usually defined as an object containing code that is executed periodically by a defined configuration setting time interval — albeit this isn’t a mandatory constraint since one could inject any code via a hook, as long as that hook implements the Sitecore.Events.Hooks.IHook interface. This interface defines one method — the Initialize() method — which has a very simple signature: it takes in no parameters and does not return anything, thus giving you lots of freedom around how you implement your hook. Sitecore.Diagnostics.HealthMonitorHook – a hook that launches a pipeline periodically to log cache, memory, and performance counter information to the Sitecore log. Sitecore.Diagnostics.MemoryMonitorHook – a hook that monitors memory periodically on the server, and clears caches/invokes the garbage collector when a defined thresholds are exceeded and settings defined in the Web.config allow for these actions. Both hooks are defined in Sitecore.Kernel.dll. Keeping with the monitoring theme of the prepackaged hooks, I decided to build a hook that monitors the size of my Sitecore databases after an elapsed period of time, and logs this information into my Sitecore log. A couple of weeks ago, I architected a Web Forms for Marketers (WFFM) solution that sends credit card information to a third-party credit card processor — via a custom form verification step — and blanks out sensitive credit card information before saving into the WFFM database. Out of the box, WFFM will save credit card information in plain text to its database — yes, the data is hidden in the form report, although is saved to the database as plain text. 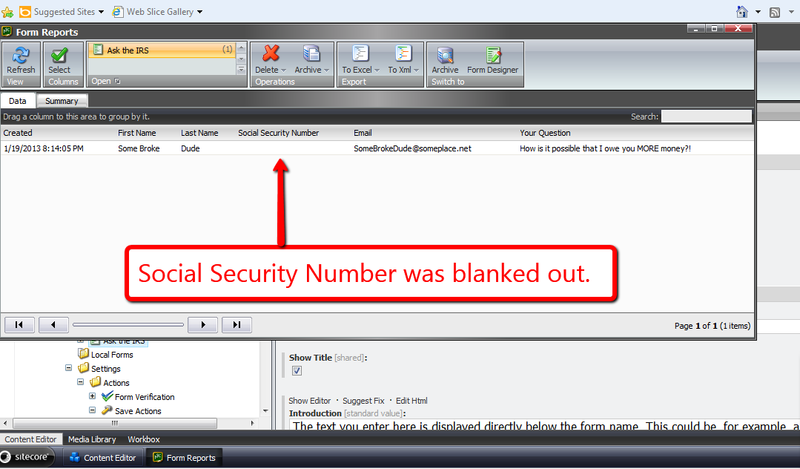 This information being saved as plain text is a security risk. One could create a solution similar to what I had done in my article discussing data encryption — albeit it might be in your best interest to avoid any headaches and potential security issues around saving and holding onto credit card information. 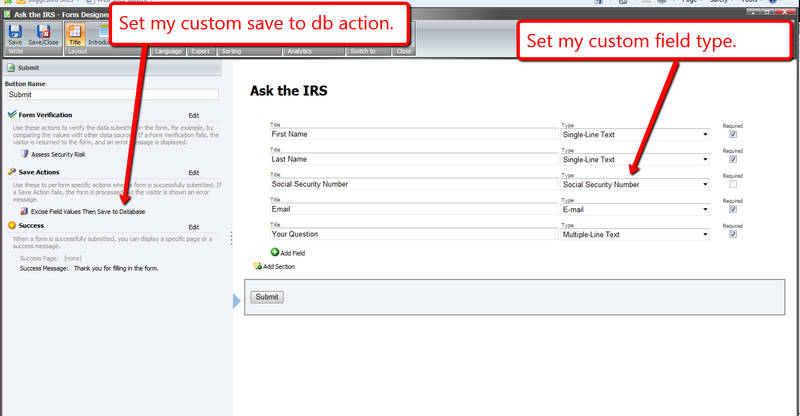 I can’t share the solution I built a couple of weeks ago — I built it for my current employer. 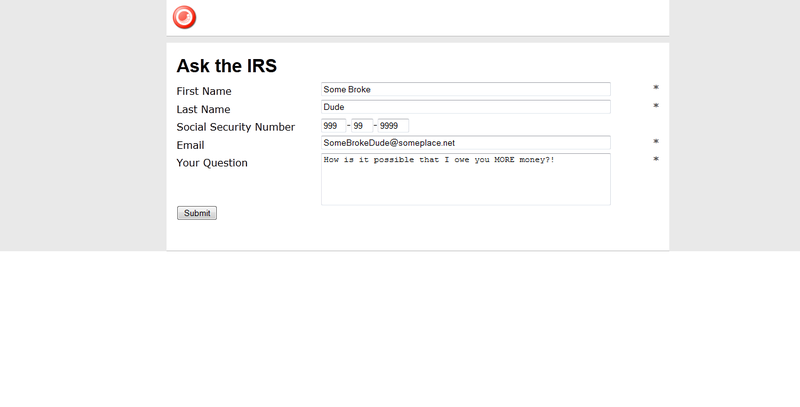 I will, however, share a similar solution where I blank out the value of a field containing a social security number — a unique identifier of a citizen of the United States — of a person posing a question to the Internal Revenue Service (IRS) of the United States (yes, I chose this topic since tax season is upon us here in the US, and I loathe doing taxes :)). My WFFM excisor will take in a collection of WFFM fields and return a new collection where the targeted field values — field values that I don’t want saved into the WFFM database — are set to the empty string. I set this form on a new page item, and published all of my changes above. A similar solution could also be used to add new field values into the collection of fields — values of fields that wouldn’t be available on the form, but should be displayed in the form report. An example might include a transaction ID or approval ID returned from a third-party credit card processor. 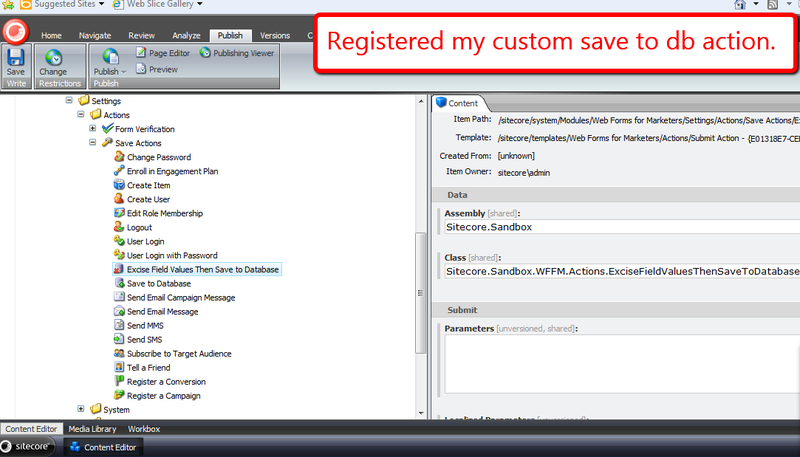 Instead of ripping values, values would be inserted into the collection of fields, and then passed along to the base save to database action class.